Ask your average music fan who invented rock n’ roll and you are likely to hear names like Chuck Berry, Little Richard, maybe Fats Domino, Jerry Lee Lewis or Elvis. All of those answers are worthy of debate. Though I would argue those artists all share a common musical patriarch. Those that know a thing or two turn their ears toward the smoky bar rooms of the Crescent City – New Orleans. For it was here that the gifted fingers, gravelly vocals and twisted mind of Henry Roeland Byrd built the foundation from which rock n’ roll was to build. Byrd spent the better part of his younger days in the shadowy underbelly of New Orleans, earning his keep in the street as a petty hustler and card shark. It wasn’t until after being discharged from World War II that Byrd, well into his thirties, discovered his knack for slapping a piano line that sent feet shuffling and hips swiveling. A steady, rolling bass. A sauntering, frivolous right hand. A tinge of rhumba. Byrd’s barking vocals howling harsh, blues-driven melodies above it all. Wild and bizarre, yet perfect. Byrd was a man with as many names as personalities. Known by some as Roy “Bald Head” Byrd, he is most commonly called by his stage name Professor Longhair or “Fess” for short. In late 1949, Byrd laid down four tracks for the Star Talent record label, including what would become his signature “Mardi Gras in New Orleans.” He recorded a handful of releases throughout the 1950s for both Atlantic and Mercury, but was never able to achieve substantial commercial success. Meanwhile, younger artists like Domino, and later Dr. John, won critics and fans by honing the best aspects of Byrd’s work and cleaning them up to a more accessible, radio-friendly end. 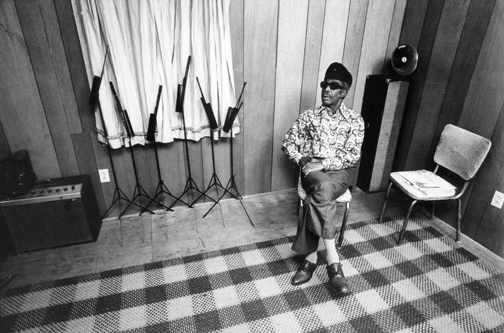 Professor Longhair’s lone hit of the sixties came with his 1964 rendition of Earl King’s “Big Chief.” By the end of the decade he had slipped into irrelevance, returning to the perils and temptations of the Crescent City streets. Rumors swirled that Byrd had lost his mind. He lost teeth, drank heavily and rarely performed. When he surfaced, it was to perform odd jobs – reduced to sweeping record shop floors, so the story goes. He continued in relative obscurity, playing the occasional impromptu Mardi Gras performance until 1971. That year, Quint Davis, founder of the New Orleans Jazz & Heritage Festival placed Byrd at the center of a performance that would revitalize his career. Professor Longhair served as the highlight of a concert that featured a veritable who’s who of the New Orleans R&B scene that he had helped to create a few years earlier. The Meters, Dr. John, Earl King, Allen Toussaint and others all came together in support of their forlorn forefather. Byrd enjoyed a renaissance of sorts throughout the 1970s, touring Europe extensively and releasing several more albums. He died of a heart attack in January of 1980 at the age of 61. He was posthumously inducted into the Rock & Roll Hall of Fame in 1992. Listen to Professor Longhair. Listen to the keys. The essence of rock n roll resides within that signature New Orleans bounce.